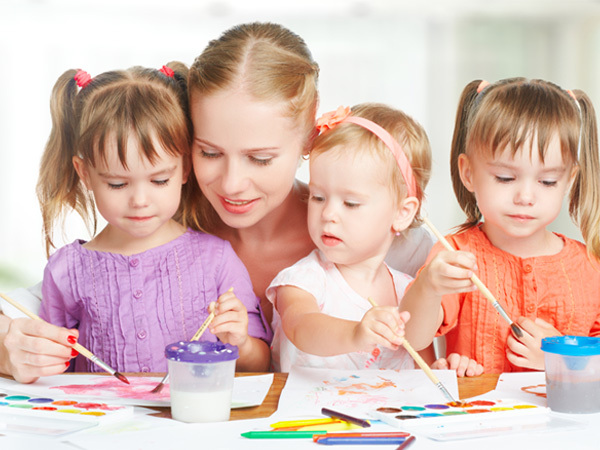 The two year-old program is designed to continue the ‘at home’ feel with gently structured, yet fun activities. Your child will learn Spanish through play and song, at meal times and even at diapering. We will also help you and your little one transition to potty training. Children in our 3 -year-old program will have fun learning in two languages. They will learn letter recognition, counting, exploring as a scientist. They will explore and even create the lessons as they are emerging as leaders and little teachers. Children in our 4-year-old program will have fun learning in two languages. Our program is designed to prepare children academically, socially and culturally for Kindergarten. They will build their phonics, reading, math and interpersonal skills. We create an environment where learning a new language is safe and making mistakes is safe. We love encouraging creativity! In our Bilingual 5-year-old & K-Wrap Program, children learn through an immersion method. Your child will explore, speak, read and write in Spanish and English. The children learn through creative play, songs, books, and formal instruction. Our 5 year old K Wrap program offers families who enrolled their child in local public kindergarten part time to learn in English and Spanish and be prepared academically, socially and culturally for First Grade.